to be a sign that will be rejected; and you too will be pierced to the heart’. I John 2. 3 -11; Psalm 96. 1 – 3, 5 - 6; Luke 2. 22 - 35. Today we commemorate the martyrdom of Thomas à Becket. Thomas as the Archbishop of Canterbury, appointed by Henry II in 1162, came to know something of a sword piercing his soul as he struggled to be faithful to his Lord and His church in his conflict with the King. Henry had believed by appointing his Chancellor and friend as the new archbishop all his problems, disputes and fights with the clergy would be over. However he had not bargained on Thomas' sense of duty. The service which he had given the King was now transferred to Christ and the Church. We all probably know the inevitable outcome of this feud as these two strong characters clashed over clergy being subject to the civil law as well as to the ecclesiastic. Thomas fled England to escape from Henry’s wrath, two years after his appointment. However after living in exile until 1170, during which time by means of correspondence he continued to fight for his church, he returned to his cathedral, knowing that death was almost certain. Not only do we at the feast of Christmas celebrate at once Our Lord’s Birth and His Death: but on the next day we celebrate the martyrdom of His first martyr, the blessed Stephen. Is it an accident, do you think, that the day of the first martyr follows immediately the day of the Birth of Christ? By no means. Just as we rejoice and mourn at once, in the Birth and in the Passion of Our Lord; so also, in a smaller figure, we both rejoice and mourn in the death of martyrs. We mourn, for the sins of the world that has martyred them; we rejoice, that another soul is numbered among the Saints in Heaven, for the glory of God and for the salvation of men. Thomas knew that martyrdom was ahead. The eternal design may appear. 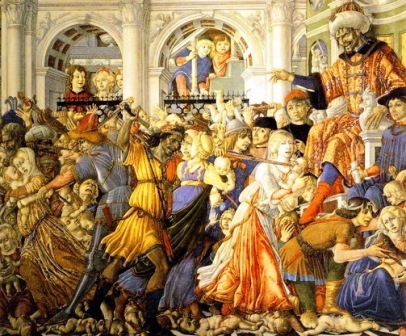 Today’s Gospel telling of the aged Simeon’s prophecy unfolds two significant factors: firstly, that Christ’s coming was as much for the Gentiles as for the Jews, and secondly, that our dear Lady through her Son would undergo much suffering. For Simeon himself, as he held the promised Messiah in his arms he knew he could now die in peace. Salvation had come to all peoples! The lesson for today from John’s first letter is a further reminder that Christians cannot escape suffering. We are told we can only be sure of abiding in Christ, if we “live as Christ Himself lived”. In Christ’s life, the tranquillity of the manger scene was soon left behind, and for the Holy Family the joy of Bethlehem soon gave way to much sadness and suffering. As we saw yesterday as a Babe with his parents Jesus was forced to flee from his home and become a refugee in Egypt. Thus very early in His life, our Lord was living out that “the Son of Man has nowhere to lay His head” (Matt. 8. 20). In the Johannine gospel Christ’s nativity was the first step in His life which would lead to Calvary where He would be glorified in death. Dear Lord, help me to take up my cross and follow you daily, even when that means suffering and sadness. Amen.